Despite a ceasefire agreement being agreed to by Karen National Union and the Burma government on January 12th fighting between both sides continues. The latest incident happened when government troops refused to stop sending military supplies through KNU held territory to their Burma Army bases. Soldiers from both sides were killed and wounded in the clash. 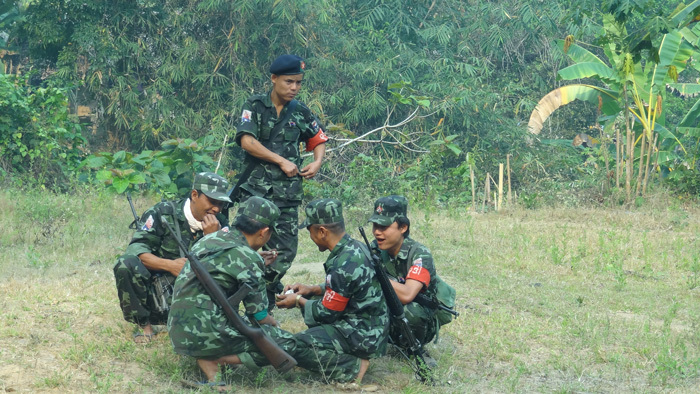 The KNU confirmed to Karen News that fighters from the Karen National Liberation Army, Brigade 5 area attacked Burma Army soldiers from Division 66 in the Khay Pu village area after the Burma army soldiers crossed over the line marking the KNU designated area on March 4. The Burma army was sending army rations and supplies to its frontline soldiers. Last week, on March 9th, the Burma Army retaliated by attacking the KNU. Major Saw Kler Doh, an office manager with the Karen National Liberation Army in Brigade 5, told Karen News. The KNLA, Brigade 5 released a notice to the Burma Army, after the preliminary ceasefire agreement, warning them not to cross over the 200 metre designated boundary line on the main road. The KNU have accused the Burma Army of sending munitions with army rations from their Busar Khee camp at Taungoo to their Koh Taw camp in Papun Township. The Burma Army’s Light Infantry Battalion 108 and Infantry Battalion 80 under Division 80 is active in the Papun area, Karen News could not confirmed the Burma Army Battalion involved in the current fighting. The KNLA’s Brigade 5 monthly report, record that there were four clashes between the Karen fighters and Burma Army soldiers in the Papun area since the preliminary ceasefire agreement. Despite the preliminary ceasefire agreement between the Burma government and the Karen National Union earlier this month the Burma Army continues to send military supplies and reinforcements to its troops in KNU controlled areas. On 1st March, President Thein Sein’s celebrated the first year anniversary of his government by speaking on state controlled television about his government’s achievements. He talked about walking the country towards a sustainable peace, that his government did not have a ‘tricky strategy’ and he wanted to build trust and engagement with ethnic groups. Two months after the preliminary ceasefire talks with ethnic armed opposition groups fighting is still ongoing in Shan, Karen and Kachin States.